Ruslana Forum / Fan Club / Ruslana makeover! hey there!! it's been so long, but i'm back!!! i found this program to make makeovers on pictures, look how cool ruslana looks! Have a fun! 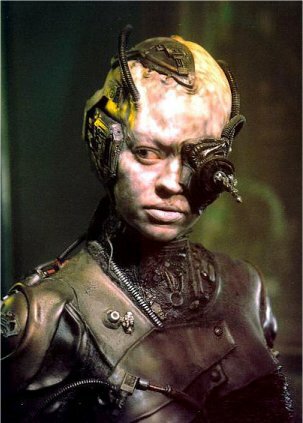 Your picture reminds me former android 7th of Nine from Startrek. I love Seven of Nine "we are the Borg, you will be assimilated"
That's a greeting which you can hear from all the borgs! I think that unfasten straight hair suits Ruslana the best. But she can experiment, of course. oh a little off topic, but maybe i could make a nice flash lay-out for the website, since i'm a professional webdesigner now, i could do that (some examples: www.romanwinter.com www.amiratasamari.com http://client.romanwinter.com/tsts ) we could keep the basis, and just instal some flask at the beginning and on top of the page, ofcourse i'll do it for free! HEY!! Don't joke with the BORG!! Come on!! Or you WILL be assimilated!! Greets from a Trekkie!! And fan of Jeri Ryan. Your picture reminds me former android 7th of Nine from Startrek. ????? How does that make over picture remind you of Seven? Wow! It's her! Comparing with first picture here. It's great artwork!